If you’re a pet owner, Nordstrom Hackett’s story probably sounds familiar. What would the holidays be without stolen treats, an episode of manger danger or a not-so-festive trip to the pet ER? We’ve gathered some of our favorite funny, sweet and, yes, cautionary pet holiday tales to make your Hanukkah, Christmas, Kwanzaa, Festivus or winter solstice celebration just a little brighter — and maybe a little safer, too. Scooter, the Becker family’s Wire Haired Fox Terrier, once devoured an entire holiday sampler tray of fruit covered in white chocolate. Thankfully, Becker says, there were no medical repercussions, other than an upset tummy. Unlike dark and milk chocolate, white chocolate contains less significant amounts of theobromine and caffeine, the substances that can give dogs (and less commonly, cats) the runs or cause vomiting, a rapid heart rate and seizures — just a few of the signs of chocolate overdose. So it’s less likely — but not impossible — to result in toxicity. That said, overindulging in white chocolate can still lead to gastrointestinal upset and the food’s high fat content can contribute to pancreatitis. If your pet eats any type of chocolate, it’s still best to contact your veterinarian or ASPCA Animal Poison Control immediately. More recently, Becker’s Pug, Bruce, has carried on the family canine tradition of food thievery. “My best friend came to my house during the holiday season with a turkey sausage in her purse,” Becker says. “Bruce smelled it and while we weren’t looking, he dug into her purse and ate the entire thing!” These days, when guests come to call, Becker greets them by asking if they have food in their bags, just to be on the safe side. 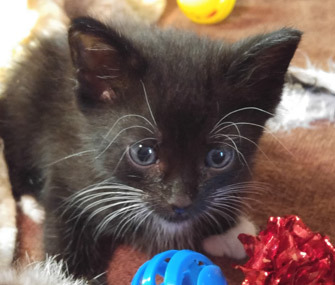 Midnight’s Christmas encounter with the table saw left a lasting memory — for everyone. “He never slept in the sawdust bin again,” Cawley says.